Trans Britain 2012 finished in the impressive shadow of Ruthin Castle with Paul Oliver setting another stage record. A year’s worth of preparation was well rewarded for Paul who also smashed the overall course record with some quite exceptional performances – a well-deserved and convincing winner. He wasn’t alone though as Tom Perry also broke the old stage record as well as being just a few seconds short of a full hour inside the old overall record. Steve Platt, who was a joint holder of the old record, just failed to beat the old overall record by a mere 13 minutes. Others to beat the old mark were Chris I’Anson who was third for the leg, Mark Chapman and David Magill proving that this was a very high quality field. Matt Kitt, new to this type of running, finished strongly and a special mention for Andy Collings who had a storming sub 5 hour run over the mountains on day three ran the last leg on a badly inflamed ankle and some pain. 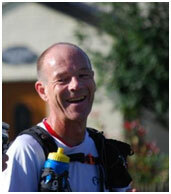 Paul Oliver described the course on the 3rd day as the best days ultra-running he has had the pleasure to run. The views from Helvellyn, Fairfield and Dollywagon Pike make the days climbing worthwhile. His daily timeof 3 hours 56 will take some beating with much of the day spent over 2,500 feet. best overall time for a lady in 47:21:53. 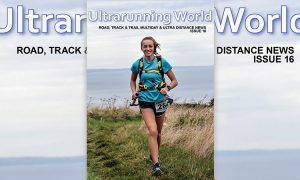 The race continues to be a highlight of all competitors running year, with individual highlights of Trans Britain varying. Some quoted the abundant portions of high quality food setting the race apart from most multiday races. Others cited the stunning trails with the amazing camaraderie also getting a mention. Trans Britain returns on 7th September 2013 with another set of running heroes, another week of great food, great company and above all spectacular running. Third place finisher Steve Platt shared some of the highlights of the race . This year was my second entry to the Trans Britain stage race, and since there were a couple of other competitors returning for a second time, including twice winner Paul Oliver, the organisers must be doing something right. 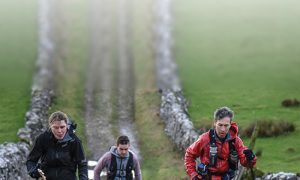 That ‘something’ includes some of the finest off-road running you can find in the Lake District, Yorkshire Dales and Clwyd hills, along with great food from Nick the resident chef and always-excellent facilities at the overnight campsites. This year’s special treat was a bathroom, no less, with seemingly limitless hot water, at the day two campsite overlooking Ullswater. There weren’t the hurricanes blowing in from the Atlantic of the previous two years, although the descent from a cloud-shrouded Pen-y-Ghent got a bit hairy with some of the gusting winds. But there was plenty of rain, swollen rivers and mud (along with the occasional shot of sunshine and a glorious double rainbow) to remind you that this is a long way from a boring urban run. Favourite moment? Storming down from Rydal fell like a kamikaze mountain goat for a ridiculous sprint finish that saw three of us separated by just 10 seconds after five hours of mountain running. 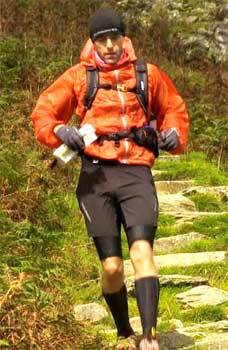 Visit Go Beyond Ultra.co.uk for more information on the 2013 Trans Britain race. Facebook Teach Africa page for updates. 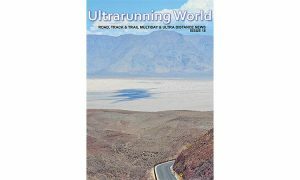 Go Beyond Ultra and Trans Britain raises money for Teach Africa and the Robyn Higgins Appeal.